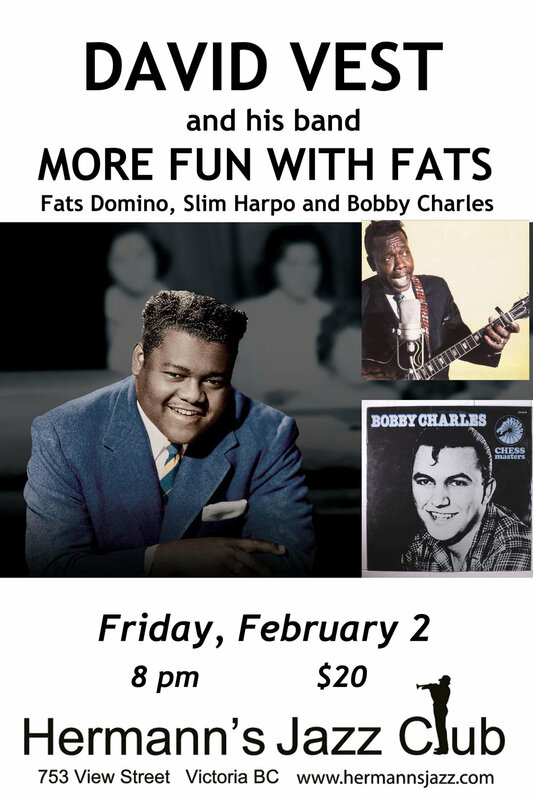 David and his band played an all-Fats Domino show last December, but there is plenty of music by the Fat Man that they didn’t get around to playing. 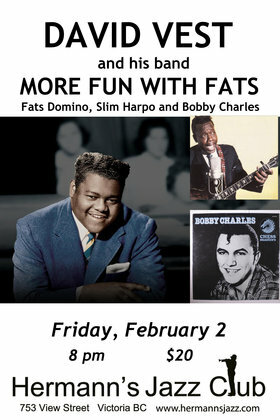 They’ll also play songs by Bobby Charles, who wrote hits for Fats as well as for Bill Haley and the Comets. And there’s no more earthy and elemental blues sound than the songs off Slim Harpo — Raining In My Heart, I’m A King Bee, Shake Your Hips, etc. His band for this show includes Damian Graham, Ryan Tandy, Tom Bowler — and possibly a mystery guest. They don’t make them as real as David Vest anymore. The son of an Alabama sharecropper, the Victoria BC resident is still going strong some 50 plus years since he first stepped on stage with the likes of Roy Orbison and Big Joe Turner. Long revered as one of the great boogie-woogie piano players, he plays it all: jazz, gospel, rock and roll, all kinds of roots music, even the odd classical number. His songs have been covered by artists ranging from Tammy Wynette to Downchild. Vest has won the Maple Blues Award for Piano Player of The Year numerous times.